Minimal Equipment Footprint: 7,000 – 8,000 sq. 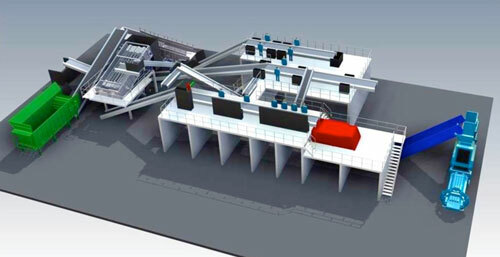 ft.
(3) OCC Sorting – Primary vibratory screen sends material to OCC conveyor where it is sent to OCC Sorting station. 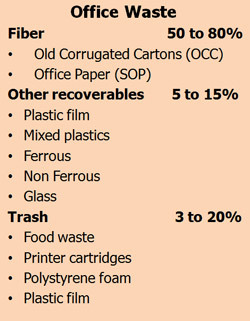 Manual sorting will remove trash, bulky plastics and metals from the OCC. These will be stored in bunkers below. (4) Ballistic Separator – Smaller material screened by Primary vibratory screen is sent to Ballistic Separator. 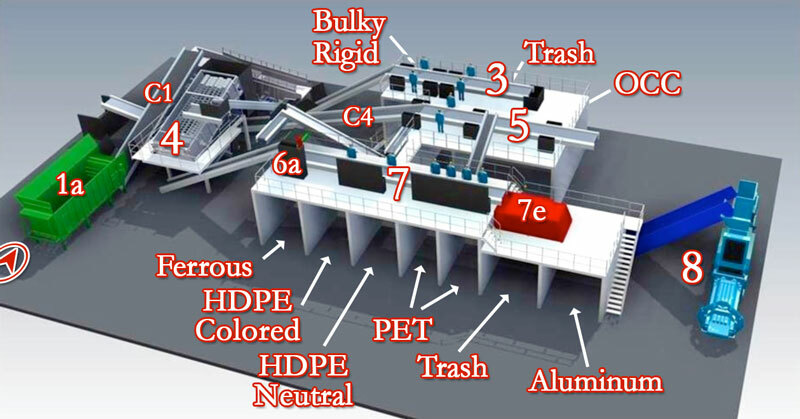 This waste material will be sized to allow majority of paper and containers to be sorted by Ballistic Separator. Minus 2 inch Fraction – falls through the Ballistic Separator’s paddle sieve mesh to Glass / Fines bunker. The drop and paddle action will break 95% of the glass to a size under 2 inches. Thicker material ( wine / champagne bottle necks and bottoms ) will roll to the container line conveyor (C5). 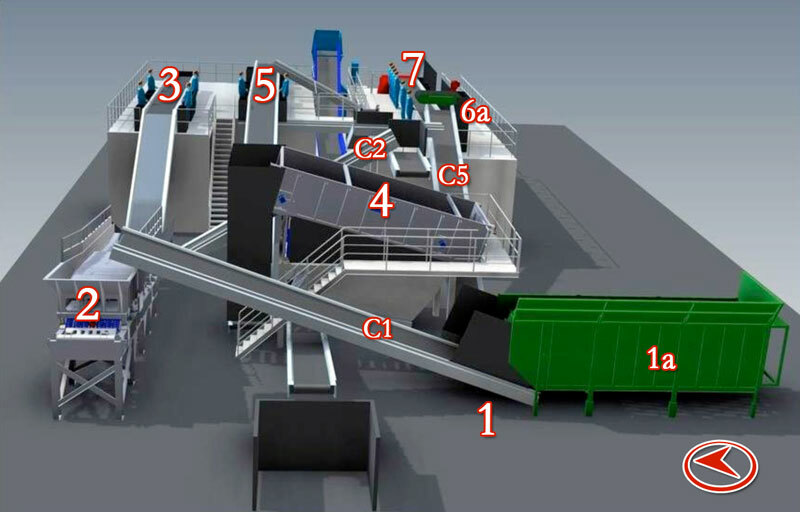 (5) Paper Sorting Line – Staff will sort 3 materials from inbound paper material on conveyor (C4). The sorted Cardboard (OCC) and trash will be dropped into 2 bunkers located below. 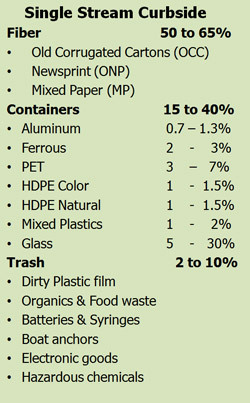 The sorted containers such as flattened plastics and aluminum will be transferred to the container sort line. 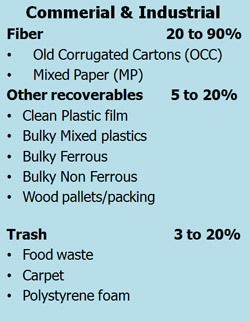 The sorted trash such as plastic film and other non-recyclable items will be removed from the stream. (6) Container Sorting Conveyor (C5) – cleated incline conveyor transfers containers from Ballistic Separator. 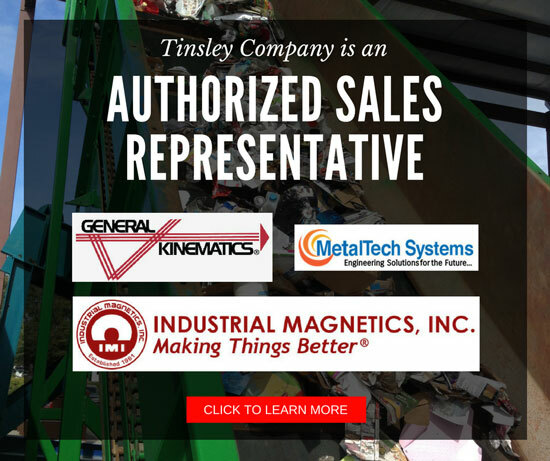 Ferrous Sorting – An over-belt magnet will pull ferrous material from the container stream as it falls to Conveyor (C6). Ferrous will fall into the bunker below this sorting platform. (7) Container Sorting Conveyor (C6) – variable speed controlled 30 inch wide conveyor, which will be sorted from one side. 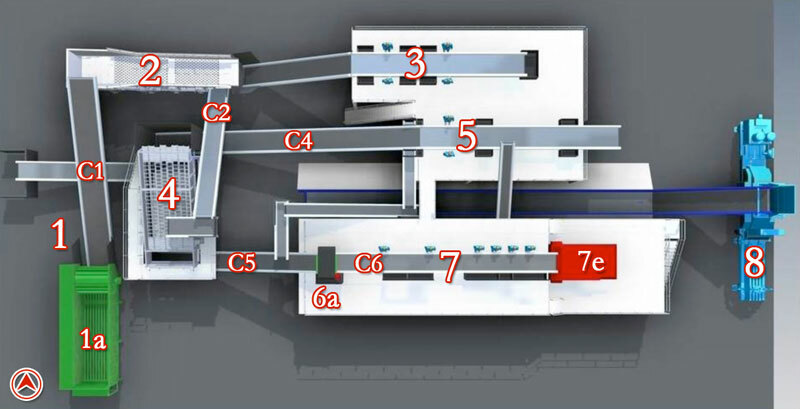 Throw chutes to bunkers under the sorting platform will allow staff to efficiently positively sort the targeted plastics at each sorting station. 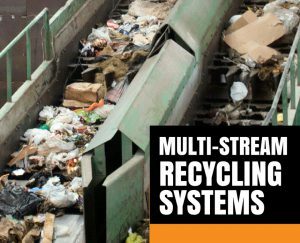 (8) Baler – Dual ram baler to allow baling of the different products from the multi-stream recycling system. The system should have at least a 15 ton per hour baler with the preferred option being a 25 ton per hour baler (100HP) to allow for growth in volume of efficient baling.